Through use of classroom space, intentional course design and scheduling, and building "brand" identity, teachers can create a startup culture of empowerment and innovation for their students. Many educators that seek to incorporate design thinking and collaborative processes into teaching and learning are looking to the unique culture exemplified by startup companies. Both nimble and energized, today's startups are redefining how "work" looks by championing disruption in innovation and enterprise. Fueled by passion and charged with a desire to make a positive impact in our world, startups creatively incorporate voice and choice, flexibility, personality, and fun into learning and working environments. By embracing these business models for learning, teachers are taking on this entrepreneurial, DIY spirit and transforming the process of making meaning and searching for knowledge. Schools and educators who choose a startup culture can essentially place a renewed focus on the role of the learner by empowering students to find authentic and meaningful problems and to search for solutions through design activities and iteration. Much like engineers that optimize their designs through building, testing, and then redesigning and building again, students in classrooms that follow a startup culture can freely explore, wonder, and evaluate over multiple iterations until they have reached success or mastery. Looking to leverage the power of the startup culture in your classroom? Check out these three distinguishing features found in the startup ecosystem, and get ready to propel ideas forward and scale learning! As this kind of environment encourages physical movement, along with communication and "social networking" within the school, students within a startup culture move between learning environments over the course of a school day to spark discovery and new perspectives. Workplace and seating flexibility are available to all students, including furniture and items such as standing desks, clipboards, and work rugs. Prepared environments are equipped with materials that allow for transparency of thought within visible thinking routines. Students are encouraged to interact with multiple modes of communication and document ideas with items such as flip charts, post-it notes, drawings, sketches, and recordings of active and interactive dialogue. 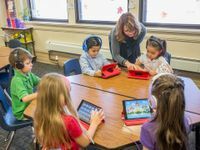 Digital tools such as Slack, Google Docs, social media platforms, and Nearpod are further used to support collaborations and partnerships both within the classroom and with global friends. Classrooms that follow startup cultures are strategically designed to support learning and growth. Environments and curricula are intentionally structured to incorporate brain-based practices that recognize the importance of time for rest, food and drink, movement, and play. Startup-culture learning cultivates student agency through voice and choice. Purposeful pedagogical decisions aim to create paths for connection to past experience as well as address meaningful problems facing the community. Classrooms following the entrepreneurial mindset of a startup company exist in a constant state of beta -- always testing and retesting through the process of iteration, innovation, and improvement. Though focused on growth, the culture remains dedicated to staying mission-focused. Clearly defined goals and a synthesized message allow for a scaled impact across all areas of learning. The class mission represents every member of the classroom community, and each member is able to effectively articulate that mission. Teachers in a startup culture can work together to build the classroom "brand" through activities such as proudly displaying the mission in the students' learning spaces, sharing messages of success on class websites and blogs, or designing a class logo and fun swag like t-shirts, water bottles, stickers, and pens. Students can also get involved by creating commercials, composing jingles made with digital programs such as Garageband or Soundtrap, or developing a class elevator speech (a concise message designed to convey a thought in the time that it typically takes to ride an elevator from the bottom to the top of a building). An ongoing goal for members of the class in a startup culture is to feel a sense of ownership and pride as they work to protect the integrity of their class identity -- because it's also their identity. As part of a community of young creators, engineers, problem solvers, designers, collaborators, and dreamers, students can work as a classroom learning team, find inspiration in unanswered questions, and ultimately push ideas forward into a reality to make a positive impact on our world. You may already be practicing elements of a startup culture in your classroom. Please tell us about it in the comments section of this post.